I'm home after two great shows on Create and Craft with Martin & Dave. 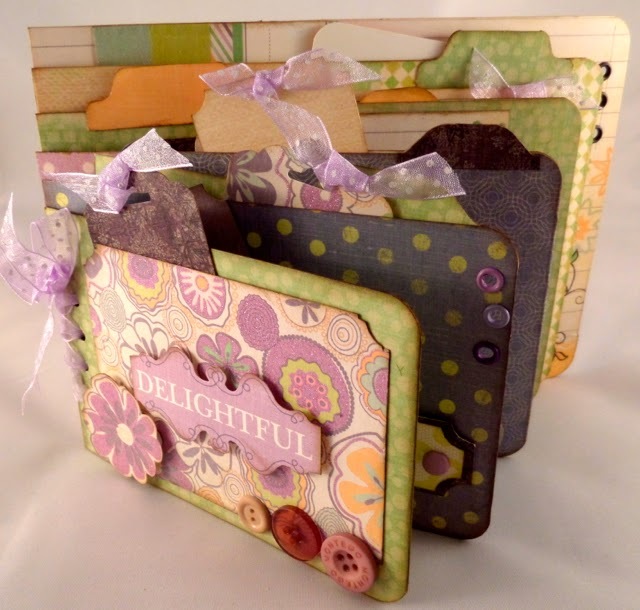 The pic above is of one of the samples I'd made from the DCWV Delightful Stack. A gorgeous paper stack full of 48 single sided co ordinated papers in soft tones, some with glitter to add a hint of sparkle to your projects. Now I'm unpacking today's bags and then repacking them ready to travel down to Falmouth tomorrow and then to Mullion on Friday for a G45 Botanical Tea Workshop with Margaret and her ladies. Only two more sleeps to go :-) Whoo hoo. I'll be staying a couple of days with my sister too and we're hoping to get out and about on Saturday to take in the scenery so fingers crossed the rain stays away so we don't get soaked. Now onto this months Giveaway. Thank you for all the comments you've left left on the April Giveaway post. Our winning number this month selected by Random.org 33 and comment 33 was left by Angie Garcia. Congratulations Angie. If you could mail your address to me at mycreativespirituk@gmail.com I'll get your goodies in the post to you. Huge thanks too to Paula and Gary for donating the gorgeous card trio this month. Our May giveaway will be up on the blog in a couple of days so please call by again and leave a comment. If you're not in it you can't win it so the saying goes. Hi Clare, was able to watch you on C & C!!! I too have some DCWV pads but did order some more afterwards!!! Wow sounds like you are having a busy week to be sure. Fun but tiring!!! Have fun with your sister and even if it rains you will still enjoy it!! Thank you again for all your inspiration, you are the best!! Take care. Hi Clare, Please may we have a tutorial on the above tag album. It looks great. Love the papers too. fab and great album Clare. sorry forgot to say congratulations to Angie. Hi Clare, Congratulations to Angie, you lucky girlie !! Fabulous shows, Clare, on C&C, I love your fussy cutting. A beautiful mini album, such gorgeous colours. Here's hoping your packing is going well, have a good time !! I am so happy I stumbled across your web page right after checking websites on checklist for a data centre relocation. I found the my creative spirit and I find it extremely one of a kind. I make sure my close friends will certainly adore it too.